Howard Francis Rieger was born on 27 June 1898 in Niagara Falls, Niagara County, New York. Frank J. Rieger and Lillian L. Hoffman appeared in the US federal census of 1 June 1900 in Niagara Falls, Niagara County, New York, at 1640 Eighth Street. Other members of the household included Howard Francis Rieger. Frank J. Rieger and Lillian L. Hoffman appeared in the New York state census of 1 June 1905 in Niagara Falls, New York, at 1640 Eighth Street. Other members of the household included Howard Francis Rieger. Frank J. Rieger and Lillian L. Hoffman appeared in the US federal census of 15 April 1910 in Niagara Falls, New York, at 1640 Eighth Street enumerated not far from Lillian's parents.. Other members of the household included Howard Francis Rieger. Frank J. Rieger and Lillian L. Hoffman appeared in the New York state census of 1 June 1915 in Niagara Falls, New York, at 1640 Eighth Street. Other members of the household included Howard Francis Rieger. Howard Francis Rieger registered for the draft on 12 September 1918 in Niagara County, New York, while living with his mother in Niagara Falls, employed there as an insurance broker by the Woodward Agency. Lillian L. Hoffman appeared in the US federal census of 1 January 1920 in Niagara Falls, Niagara County, New York, at 1?40 8th Street. Other members of the household included Howard Francis Rieger, Clifford M. Strowger and Earl Byron Strowger. He was an insurance broker, according to the 1920 census. He married Ada Pearl Crossett, daughter of Oliver F. Crossett and Minnie Bell Bush, on 4 October 1921 in Niagara Falls, New York. Pearl was naturalized as a US citizen by virtue of the marriage..
Howard Francis Rieger and Ada Pearl Crossett arrived in the Port of New York on 7 March 1927, accompanied by Lillian L. Hoffman aboard the SS Lafayette, having departed New York on 4 February. The following appeared on 10 March 1927 in the Niagara Falls Gazette: Mr. and Mrs. Howard Rieger and Mrs. Lillian Rieger of Division avenue have returned from several weeks' cruise to the West Indies and the Panana canal zone. Howard Francis Rieger and Ada Pearl Crossett appeared in the US federal census of 1 April 1930 in Niagara Falls, Niagara County, New York, at 1819 Michigan Avenue. He was self-employed as an insurance agent, according to the 1930 census. Howard Francis Rieger and Ada Pearl Crossett appeared in the US federal census of 1 April 1940 in Niagara Falls, New York, at 1819 Michigan Avenue. He was employed as an insurance broker, according to the 1940 census. Howard Francis Rieger died on 4 April 1951 at age 52 in Lewiston, Niagara County, New York, at Mount St. Mary's Hospital. Ada Pearl Crossett became a widow at his death. 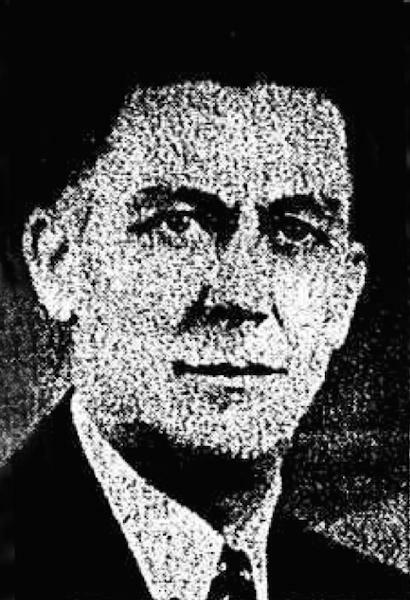 The following appeared on 4 April 1951 in the Niagara Falls Gazette: Howard F. Rieger, well-known Falls insurance agent and an active member of the BPO Elks, died early today at Mt. St. Mary's hospital after a short illness. A Niagara Falls native, he was 52. Mr. Rieger, who lived at 941 South avenue and operated an insurance agency with Harry C. Long, had been installed, by proxy, last night as treasurer of Elks Lodge 346. He was exalted ruler of the Elks from 1933 to 1934 and in 1941 and 1942 was district deputy grand exalted ruler. Mr. Rieger was also a member of the grand lodge scholarship committee of the New York State Elks and a member of the past exalted rulers, exalted rulers and secretaries association of the Elks' New York State West district. He was named treasurer of Lodge 346 in 1949. He joined the local lodge on January 10, 1929. Mr. Rieger was born in this city on June 27, 1898, the son of Frank and Lillian L. Rieger. His mother, and his wife, Pearl A. Rieger, survive. Mr. Rieger also was a member of the Niagara Falls and New York State Insurance associations. Funeral services will be Saturday at 9 a.m. at the Beatty Funeral home, 1001 Ontario avenue and at 9:45 a.m. at Sacred Heart church. Lodge 346 will hold services at the funeral home at 8:30 p.m. Friday. Interment will be in Gate of Heaven cemetery. The following appeared on 7 April 1951 in the Niagara Falls Gazette: Funeral services for Howard F. Rieger, 941 South avenue, will-known insurance agenty who died Wedensday, were held at Sacred Heart church today with the Rev. John F. Donohue, Warsaw, officiating at a Solemn Mass of Requiem assisted by the Rev. John M. Ryan, of St. Teresa of the Infant Jesus church and the Rev. John O'Connor, of Sacred Heart church. Niagara Falls Lodge 346, BPOE, conducted services last night a tthe Beatty Funeral home. Mr. Rieger was an active member of the lodge and a former state and district officer of the Elks. Pall bearers, all past district deputy grand exalted rulers of the Elks, were Theodore Moses, North Tonawanda; Earl Stoll, Tonawanda; Connell McGinnis, Wellsville; Albert Voegle, Lancaster; Frank Morten, Olean, and William Wean, Buffalo. Twenty-three past exalted rulers of the Niagara Falls lodge acted as honorary bearers at the services, which were attended by members of the lodge, insurance business associates and friends of Mr. Rieger. Interment was in Gate of Heaven cemetery. The following appeared on 18 May 1955 in the Niagara Falls Gazette: Mr. and Mrs. Norman Wood will take a wedding trip to Hawaii after they are established in their ohme at 9 Gowrie St., W. Tilsonburg, Ont. The former Mrs. Howard Rieger, Niagara Ave., and the bridegroom were united in marriage at St. Basil's Church, Brantford, Ont., May 11, with the Rev. G. W. Ryan officiating. The bride wore an aqua suit with pink accessories, complemented with a corsage of pink sweetheart roses. Mrs. Harvey Henry, daughter of the bridegroom, served as matron of honor. She chose a charcoal gray suit with white accessories, and wore a corsage of yellow sweetheart roses. Maj. Harvey Henry served as best man. A wedding dinner was served at the Kerby Hotel, Brantford, which was followed by a reception for the bridal party and immediate friends at the Bufferin Ave. home of Maj. and Mrsa. Henry, in Brantford.